Islamabad (Agenzia Fides) - "In a world where darkness reigns, humanity desperately needs the light of peace and hope. The world continues to suffer from cruel acts of terrorism, senseless crimes, violence and brutality. Bombardment, seizures and attacks continue to occur in different parts of the world and even in our land. Therefore, there is an urgent need for peace and hope in God who forgives us for our failures. At Christmas, we celebrate the gift of God to us of His son, Jesus. 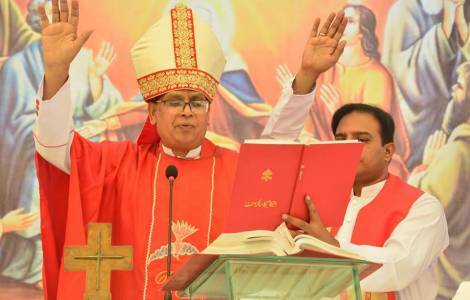 We Christians must bring this good news of the gift of God, to the world": this is how Archbishop Joseph Arshad, at the head of the diocese of Islamabad-Rawalpindi, expresses himself in his Christmas message, sent to all the faithful. "All of us - observes the message sent by the Archbishop to Agenzia Fides - experience situations where we can easily be overwhelmed by the darkness and evil in our world and in our personal lives. But the birth of an innocent child in a small, poor kingdom in the Roman Empire, two thousand years ago, gives us hope. When we invoke his name, Jesus, turns his eyes of compassion towards us. His presence gives us the ability not to be afraid. Jesus gives us comfort and challenges us to love one another".